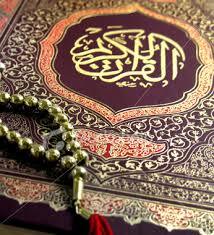 The Holy Qur'an was presented to the people of Arabia by the Holy Prophet Muhammad (Peace be upon him). It was presented in parts over a period of 23 years of his prophetic life. The book presents itself as the word of God and the Holy Prophet also presented it as such. Usually information about the past has reached us through oral reports, written reports or archaeological artifacts. For instance, the plays of Shakespeare have reached us through documentary evidence (written words). The stories of Achilles originated as oral reports (words of mouth), which were later recorded by early Greek writers. The report that Buddha used to meditate in a certain posture, has reached us through archaeological remains (pieces of art like statues and engravings). These reports are considered as matters of micro history, which are to be judged in the light of the authenticity of the narrators (in case of oral evidence), the scribes (in case of written evidence) or the artists that created the pieces of art (in case of archaeological evidence). Once the individuals are investigated, the historians turn to the question of continuity. Continuity means that the individuals involved in collecting and then transmitting the report must be shown to be in a state of uninterrupted contact and communication. We are referring to the fact that there should be an immediate proximity in time and place between the two reporters who form one ring of the chain of transmission. There should be no time when the report remained with anonymous narrators because then we cannot investigate the individuals. It should also not suffer from oblivion because, in that case, any change or corruption in the report, during the time it remained hidden from us, cannot be ruled out. If the communication between two consecutive reporters is smooth, continuous and uninterrupted, the report gathers strength. This evidence for continuity is however to be produced in respect of each stage of the chain of reporters to say with a fair degree of confidence that the report is worth consideration. If the investigation of individuals and continuity of the report leads to positive conclusions, we have established one chain of the report. Sometimes two or more such chains of reports, leading to the same event, can be established. For example, two courtiers of Akbar the Great may narrate the same incident. In such cases, the supporting narration should be identical or at least similar. If the individuals and their continuity have been investigated, these corroborating reports strengthen and reinforce each other and we are able to place more confidence in the substance brought out by them. · These individuals are not infallible. · Our investigation and judgment about these individuals can also be incorrect. The Scholars of Hadeeth of early Muslim History were alive to the above weaknesses in the information [regarding historical facts] provided by individuals. It is because of this reason that they termed an "Individual-to-Individual" report as "Khabr-e-Wahid" (or an Individual's Report). Almost the entire Hadeeth literature consists of Akhbar-e-Ahad (Individual Reports). Here we should note, that the unit of the chain of transmission of such information is not individuals, but generations. This singular difference changes the very character of such a report. An important aspect of "Generation-to-Generation" Transfer is that it does not deal with opinions and ideas of individuals but the hard facts which were witnessed, seen and/or heard by the first Generation. [i] This condition eliminates the possibility of including mythologies and opinions in the "Generation-to-generation" Transmission. 1. The reliability of the report from generation-to-generation does not hinge upon one or two individuals. It rather depends on the hundreds and thousands of people that lived together in a known place and time. 2. It is no more necessary to investigate the character, understanding, memory or impartiality of individuals. The entire generations can neither be investigated nor is it necessary. When such a large number of people convey a fact, it is impossible that all of them could have wrongly reported it, forgotten it or could have developed a consensus on telling lies. 3. There is no need to establish the continuity of reporting system because one generation is so perfectly enmeshed into another and the contact and proximity with the next generation is so tremendous and obvious that conducting an inquiry to prove it is not required. 4. When hundreds and thousands of people are conveying a fact to the next generation, we do not need any corroborating evidence. Agreement of the entire generation is so overwhelmingly strong that it renders further corroboration redundant. In the Historiography (`Ilm-e-Hadeeth) developed by the Muslims, the "Individual-to-individual" Report is termed as Khabr-e-Wahid (an Individual's Report) whereas the "Generation-to-generation" Report is called Khabr-e-Mutawatir, and the process of Generation-to-generation Transmission is known as Tawatur. We would now use the term Tawatur for the process of Generation-to-generation Transmission of a fact. The Holy Qur'an has reached us through the process of tawatur - historical continuity and perpetuation achieved through transfer from generation-to-generation. When we say that the Qur'an has reached us through tawatur, we imply that so many people in every generation conveyed it to the next and so on that there can be no doubt about its authenticity. It was not transmitted by a few persons in one generation to a few persons in the next. It was handed over by the entire generation to the next generation. The Generation of the Companions witnessed the revelation and compilation of the Holy Qur'an during the life of the Holy Prophet and then handed it over to the next generation and so on. During the first thirteen years of his ministry at Mecca, the Prophet Muhammad used to read out the revealed passages to the small group of his followers and non-believers. His followers used to commit the revelation to their hearts. There is evidence that the revealed verses or chapters were also written down on whatever writing material was available. [i] It is reported that when Umar, learnt that his sister and her husband had converted to Islam, he hurried to her sister's house in anger. When he arrived at her house, she hid the part of Qur'an she was reading. When Umar expressed his eagerness to see what they were reading, his sister told her to wash before touching the scripture. [ii] This shows that as early as the sixth year of the Prophet's ministry, the Qur'an was being written down, in addition to being learnt by heart. When the Prophet migrated to Medina and established a state, he made elaborate arrangements under the state machinery, for the preservation and large scale dissemination of the Qur'an. He constituted a committee of about forty of his literate companions who were assigned the task of recording the Holy Book. [iii] Hadhrat Zaid was the full time Secretary of the Committee of the Scribes. On receiving a verse or verses from Allah, the Holy Prophet used to call one of the members of the committee and get it dictated. Then the written passage was read out to the Prophet and was corrected and approved by him. It was then issued for all. People used to copy it and memorize it. Given the swelling number of his followers after Migration, the Qur'an was learnt and recorded by a large number of his followers. [v] Thus the entire Qur'an was systematically recorded and arranged on written material during the lifetime of the Prophet. However the Qur'an was recorded not in one volume but on tanned hides, stone tablets, wooden tablets, piecesof cloth etc. One complete set of the Qur'an was with the State authorities, i.e. with the Holy Prophet. It was placed in the Mosque of the Prophet (Masjid-e-Nabavi) from where any one was free to make a copy for himself or to refer to it in case he wished to memorize it. It however appears that apart from this centrally placed copy, a number of other copies also existed. A few of them must have been complete copies whereas in case of others, portions of the Qur'an were in possession of a number of Companions of the Prophet. [vi] It appears that the Official Copy, although complete, checked, and approved by the Prophet was available in the life of the Holy Prophet, yet it was not bound in one volume (bain al lawhayn). The entire Qur'an was memorized by the Prophet himself and numerous other companions. It is reported that when the revelation of the Holy Qur'an was completed, the Angel Gabriel heard the final recitation of the Holy Qur'an from the Holy Prophet. It is therefore incorrect to suggest that the Holy Qur'an was compiled and written in the days of Caliphs Abu Bakr or Uthman. It was preserved under the personal supervision of the Holy Prophet in his lifetime. It is also natural to believe that he could not neglect the task of its preservation. One of the primary missions of the Holy Prophet was to deliver the divine message to mankind. This message consisted of the Holy Qur'an. He could not shift this responsibility to later generations.